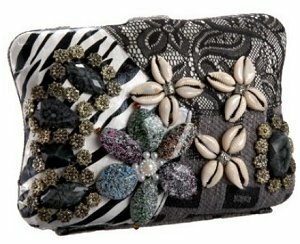 Prezzo takes mixed media to the next level with this Stone and Shell Short Clutch. I'm really not sure the label could have attached anything more to such a small purse. As it is we see flowers made from shells, other blooms made from colored stones, and a smattering of pearls, beads, and metal tidbits. And that's just the top layer. Look closer and you'll see the swatches of black lace, zebra printed fabric, and geometric patterned material peeking out from underneath. The look really isn't to my taste, but I think I'd have respected Prezzo more if it showed greater commitment to this unusual finish. However, sadly the back of the Stone and Shell Short Clutch has none of the accents, and only a single material. You'd think I'd be glad to give my eyes a break, but instead it feels like Prezzo's shortchanged anyone who embraced the bold surface. At least the label's not charging us a lot of money for this half-done mess. At $67 it's a steal for anyone who actually enjoys all that appliqué! The Prezzo Novelty bag, a great alternative to this applique bag.